Shanghai rum is a Rummy card game, based on gin rummy and a variation of Contract rummy played by 3 to 8 players. It is also known as California rummy. Shanghai rum is played with multiple decks of 54 standard playing cards, including the Jokers. Two decks are required for game of up to four players. Five or six players require three decks. Aces are high (above a King) or low, (below 2), and Jokers and black twos are wild cards. (red twos are just playing cards) Each game has 10 hands, and the rules for each hand are unique. One person begins as dealer for the first hand, and then the person to the dealer's left becomes dealer for the next hand, and so on. Each player is dealt eleven cards for the 10 rounds. The rest of the deck is then placed face down in the middle of the players; this is referred to as the deck. One card is taken from the top of the deck and placed face up next to it. This card is called the upcard and becomes the beginning of the discard pile. Each player has a choice at the beginning of their turn. They may either pick up one new card from the top of the deck or take the upcard. (Also, the other players in the game have the ability to get the up card.) After the player draws his card, either from the deck or the upcard, he must then choose any card in his hand to discard, and he then places this card face up on the discard pile. That card then becomes the new upcard, which the next player in turn can take or other players can buy. To get a card that isn't yours a player must say, “BUY", before the next player draws their card, or else it is already considered "dead". Once a player discards their card the card underneath that card is now considered a "dead" card because it is no longer in the game. Players may not take these cards. Jokers and black 2s are wild cards and can be played in the place of any card. A player is not allowed to have more jokers or 2's than face-cards in either a set or run. An example of this would be if one is trying to get a set he must have three or more cards of the same rank (8/8/8). But if a player has a joker or 2 he could play in place of an 8 (8/8/joker). But a player cannot lay more jokers or black 2's than face-cards (8/joker/joker). However he may lay the same number of jokers or black 2's as face-cards (8/8/joker/joker). The same applies for runs. If a player has a run of ((4/black 2/6/7)(of clubs)) and another play has a 5 of clubs, he may switch the black 2 with the 5 of clubs and move it either to the top or to the bottom of the run. A player may only replace a black 2 when it is their turn. If a player has already laid down, but is able to replace black 2, he may replace the black 2 but may not remove it from that specific meld. Instead they may move the joker or 2 to the beginning or end of the meld (if it is in a run). To buy a card, a player says "Buy". Each player is allowed two buys per hand . A buyer takes the upcard plus two additional deck cards, giving the buyer a total of three additional cards. A player is limited to 2 buys per round. The priority for buying goes in the order of play. In case of a tie, the person seated in closest order to the left of the current player gets priority. The current player cannot buy a card. However, the current player has precedence over the other players, so he can take the upcard even if other players want to buy it. If the player has not gone down and doesn't have a card they can discard, (after drawing their card) they made buy two cards. They DO NOT discard when they buy then. The object of each hand is to come up with the correct combination of cards to be able to meld, or "lay out". The combination for each hand is different, and they become more difficult with each subsequent hand. The combinations for each hand are either sets or runs (seq) or a combination of both. A set is a combination of a specific number of cards of the same rank, and the suit is not important. An example of a "set of 3" is three cards that are all 8's, and the 8's can all be of different suits. A run is a combination of a specific number of cards of the same suit that have consecutive ranks. An example of a "run of 4" is the 4, 5, 6, and 7 of clubs. An example of a combination for a hand is for hand #2, "1 set of 3 and 1 run of 4." This means that a player must have both a set of 3 cards and a run of 4 cards in his hand before he can meld. A player can meld only when it is his turn. As always, he must start his hand by drawing a card, then when he has the correct sequence of cards, he can meld or "go down." He does so by laying his meld cards face up on the table in their correct sequence. After melding, a player can then play on the melds of other players. When done, he must then discard. The player may not discard a playable card. If the player does not have a discard he must buy 2 cards from the deck cards, and does not have to discard when he buys. In order for anyone, the player has to play his last card. When a player is "down" (meaning he has already melded), he still takes his turn in turn with the other players, and he still must draw a card and discard. However, a player who is down cannot buy a card, nor can he stop a player from buying the top card in the discard pile when it is his turn. A player who is down can play his cards on the melds that have been completed either by himself or by other players. For example, if a player has laid down a set of 8's, and on a subsequent turn he then draws another 8, he can play this 8 on his set of 8's. He does this by placing the 8 with the set of 8's. If he has a card that he would like to play on a run, he must be sure to keep the order of the run. For example, if there is a run of 5 consisting of 4-5-6-7-8 of clubs, the player can play a 3 of clubs or a 9 of clubs. If a run has a joker, he can not replace the joker with the appropriate card, but if the run has a black 2 (as a wild card), he may choose to replace if with the correct number and move the 2 either up or down. 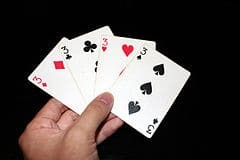 Play progresses until the final hand when one of the players "goes out," meaning he is able to play the last card in his hand. Although players may discard throughout the game, to win they must be able to lay down all of their cards without discarding. In order to win, on a player's turn they must be able to draw a card and then go out without a discard. The winner of the hand gets zero points, and the other players count their cards to determine their score for the hand. After all seven hands are played, the winner is the player with the lowest score.